Hospice and palliative care empowers people facing a serious or life-limiting illness to live as fully as possible, surrounded and supported by family and loved ones. At Haven, we believe that everyone deserves comfort, care and compassion. Through pain management and symptom control, caregiver training and assistance, and emotional and spiritual support, Haven provides quality of life at the end of life — allowing patients to live fully and make more meaningful moments until the end, surrounded and supported by the faces of loved ones, friends and committed caregivers. In 2016, Haven had the honor and privilege to serve 16,802 individuals and families throughout North Florida. During that time, Haven provided counseling and grief support services to 10,766 individuals and families in the communities we serve. During National Hospice Month, Haven encourages members of the community to learn more about hospice as an important option before an individual or their loved ones are faced with a medical crisis. 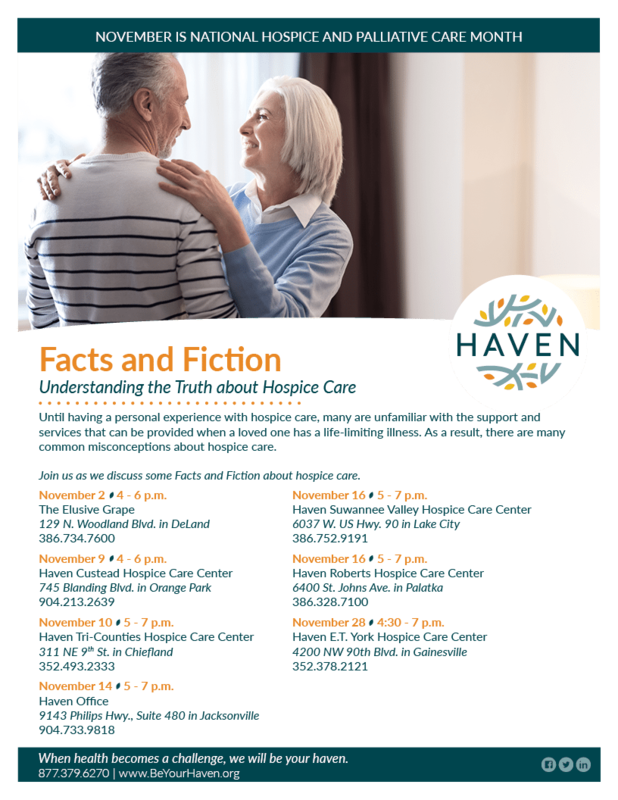 Haven is an advocate and educator about advance care planning to help individuals make decisions about the healthcare they would want to receive should they have a serious or life-limiting illness or if they were unable to speak for themselves. Please see the flyer below for educational events about National Hospice Month across North Florida. Each year, hospice saves Medicare more than $2 billion by providing solutions for physicians, care to patients and comfort to families. What Are Families Saying About Haven? My family and I would like to thank everyone for your kind and excellent care of my mother, Hortense Hill. We will never forget how you took care of her and us. Jerry and I would like to express our deepest devotion to you. This was probably the most difficult situation anyone can go through. But from the bottom of our hearts, we want you to know that your gentleness and kindness were so appreciated. We would not have been able to handle losing our son, Kevin, to our dear Lord. You provided dignity in such a special way. You are angels. We will always cherish all of you! Thank you so much.